The past five decades – spanning from the time when the Silent Generation (today, in their 70s and 80s) was entering adulthood to the adulthood of today’s Millennials – have seen large shifts in U.S. society and culture. It has been a period during which Americans, especially Millennials, have become more detached from major institutions such as political parties, religion, the military and marriage. At the same time, the racial and ethnic make-up of the country has changed, college attainment has spiked and women have greatly increased their participation in the nation’s workforce. Our new interactive graphic compares the generations today and in the years that each generation was young (ages 21 to 36) to demonstrate the sea change in young adults’ activities and experiences that has occurred over the past 50 years. 1 Today’s young adults (Millennials ages 21 to 36 in 2017) are much better educated than the Silent Generation. The educational trajectory of young women across the generations has been especially steep. Among Silent Generation women, only 9% had completed at least four years of college when they were young. 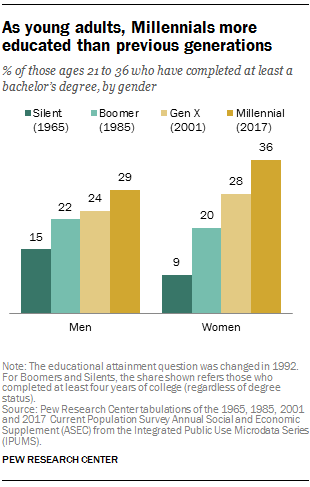 By comparison, Millennial women are four times (36%) as likely as their Silent predecessors were to have at least a bachelor’s degree at the same age. Educational gains are not limited to women, as Millennial men are also better educated than earlier generations of young men. Three-in-ten Millennial men (29%) have at least a bachelor’s degree, compared with 15% of their young Silent counterparts. These higher levels of educational attainment at ages 21 to 36 suggest that Millennials – especially Millennial women – are on track to be our most educated generation by the time they complete their educational journeys. 2A greater share of Millennial women have a bachelor’s degree than their male counterparts – a reversal from the Silent Generation. In the past half-century, growing shares of both men and women have earned a bachelor’s degree. However, women have made bigger gains over the period. Among Millennials ages 21 to 36 in 2017, women are 7 percentage points more likely than men to have finished at least a bachelor’s degree (36% vs. 29%). Back when Silents were ages 21 to 36, women were 6 points less likely than men to have finished at least four years of college education. Gen Xers were the first generation of women to outpace men in educational attainment, with a 3-percentage-point advantage among Gen X women ages 21 to 36. By comparison, the Baby Boom generation was the most recent in which men were better educated than women, having a 2-point advantage over young Boomer women. 3Young women today are much more likely to be working, compared with Silent Generation women during their young adult years. In 1965, when Silent women were young, a majority (58%) were not participating in the labor force and 40% were employed. Among Millennials, that pattern has flipped. Today, 71% of young Millennial women are employed, while 26% are not in the labor force. This shift to more women in the workplace occurred as early as 1985, when Boomers were young. Then, nearly seven-in-ten young Boomer women (66%) were employed and 29% were not in the labor force. 4Millennials today are more than three times as likely to have never married as Silents were when they were young. About six-in-ten Millennials (57%) have never been married, reflecting broader societal shifts toward marriage later in life. In 1965, the typical American woman first married at age 21 and the typical man wed at 23. By 2017, those figures climbed to 27 for women and 29.5 for men. When members of the Silent Generation were the same age as Millennials are now, just 17% had never been married. Still, about two-thirds of never-married Millennials (65%) say they would like to get married someday. When asked the reasons they have not gotten married, 29% say they are not financially prepared, while 26% say they have not found someone who has the qualities they are looking for; an additional 26% say they are too young and not ready to settle down. 5Millennials are much more likely to be racial or ethnic minorities than were members of the Silent Generation. Fifty years ago, America was less racially and ethnically diverse than it is today. Large-scale immigration from Asia and Latin America, the rise of racial intermarriage and differences in fertility patterns across racial and ethnic groups have contributed to Millennials being more racially and ethnically diverse than prior generations. In 2017, fewer than six-in-ten Millennials (56%) were non-Hispanic whites, compared with more than eight-in-ten (84%) Silents. The share who are Hispanic is five times as large among Millennials as among Silents (21% vs. 4%), and the share who are Asian has also increased. However, the share who are black has remained roughly the same. 6Young Silent men were more than 10 times more likely to be veterans than Millennial men are today. Although Millennials came of age at a time when the United States engaged in military conflicts in Iraq and Afghanistan after the Sept. 11 terrorist attacks, they are far less likely to have served in the military than their Boomer or Silent predecessors. Among men, only 4% of Millennials are veterans, compared with 47% of Silent men, many of whom came of age during the Korean War and its aftermath. The number of young men serving in the active-duty military has decreased drastically since the establishment of an all-volunteer force in 1973, which is reflected in the decreased share who are veterans since then. Comparable historical data for veteran status by generation is not available for women, but contrary to men, the number of women serving in the active-duty military has risen in recent decades. 7Greater shares of Millennials today live in metropolitan areas than Silents or Boomers did when they were young. In 1965, when members of the Silent Generation were young, two-thirds (67%) lived in a metropolitan area, while one-third (33%) lived in non-metropolitan areas. And a similar share of Baby Boomers (68%) lived in metro areas when they were young. By comparison, more recent generations are residing in metropolitan areas at higher rates. More than eight-in-ten Gen Xers (84%) lived in metropolitan areas when they were young and about nine-in-ten Millennials (88%) today live in metro areas. Note: This is an update of a post originally published on March 19, 2015.